459' 1" by 63' by 25'9"
Most units eventually landed the 3" guns to make room for 4x2 40mm Bofors AA guns and 18 20mm guns. Machinery varied somewhat, with some units having slightly different diesel machinery and later units having geared turbine machinery, a slightly lower speed (15.5 knots) and bunkeratge of 1630 tons fuel oil. 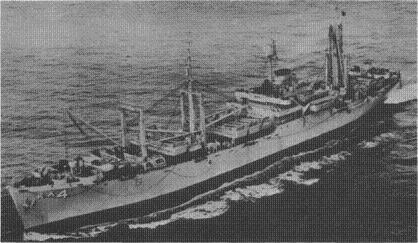 The Arcturuses were Maritime Commission standard C2-S-AJ3 vessels converted for use as Navy cargo ships. The first two units were acquired in 1939 and were among the most modern cargo ships operated by Navy crews when war broke out. Additional units were acquired in 1942. Originally designated as cargo ships, they were later redesignated as attack cargo ships, and equipped with 8 LCM(3) and 12 LCVP, Winn davits, and two quadrupod masts supporting 30- and 10-ton booms. Not technically an Arcturus, but a one-off C2 conversion with approximately the same characteristics.